Some time in the late 1980s, at the height of the first Palestinian intifada, Israeli poet/lyricist/author/publicist Jonathan Geffen devoted one of his regular newspaper columns to Israeli music. Geffen, renowned as an eloquent cynic in his often dour critique of Israeli society, began his piece by articulating the general sense of shock and depression that had taken over much of Israeli cultural and intellectual life in that period, particularly among those identified with the country’s left-of-center political camp, for which Geffen was a spokesperson. Depressing though the situation was, Geffen wrote, there was one bright spot: In a country so small and crisis-ridden, the extent and range of musical creativity was to him a small piece of veritable redemption. The music and musicians who stand at the center of Benjamin Brinner’s Playing Across a Divide are a part of the phenomenon that was a source of some consolation to Geffen. They are all to a significant extent products of the cultural and political upheavals that characterized that period of the late 1980s and early 1990s in a rapidly changing Israel. They also fit nicely into recent scholarly trends that are seeking to explore Israel—and, as in this case, even the painful topic of Arab-Jewish and Israeli-Palestinian relations—through lenses beyond those of political strife and military conflict. Brinner’s study is, in this regard, not only a reflection of Israel’s rich musical landscape but an important contribution to scholarship on the variegated social and cultural topography of which it is a part. One of the central goals of the book, as Brinner writes, is to point to the intertwining of the musical and the socio-political. And indeed, two of the book’s central themes suggest the impact of music on the politics of relations between Palestinians (Israeli and non-Israeli) and Israeli Jews; and, secondly, on the complicated encounter between the cultures of Jewish Israel and the Arab Middle East. While some of the most prominent musicians and ensembles Brinner discusses have shied away from the explicitly political (often quite deliberately and self-consciously), Brinner argues that a central “geopolitical image” nevertheless emerges from what he terms “Israel’s ethnic music scene.” It is a message, he writes, that “minimizes political borders and divisions between peoples” and is, he implies, political, even if at times in spite of itself (295). It is, in other words, a musical “scene” deeply rooted in a corresponding socio-political sphere that has historically borne a similar message. This is a connection that Brinner might have explored in some greater depth. Indeed, there is an interesting irony—itself worthy of analysis—in the fact that politically, Israel’s “peace camp” has all but collapsed since the outbreak of the second Palestinian Intifada, while the musical scene in which, at least according to the claims and aspirations of many of Brinner’s subjects, a new Middle Eastern sound is being created, has remained a powerful, perhaps even growing, socio-cultural presence. That such a sound does indeed seem to be in the making testifies to the second of Brinner’s central themes. At the heart of Brinner’s study—and, as he indicates, at the very heart of the work of most of the musicians he studies—is a sense of Israel as a site that in some ways bridges a conceptual and musical divide between “east” and “west.” Indeed, from its earliest days, Zionist cultural work found itself caught in a tension between a sense of inherent westernness and a feeling of belonging to the east. As Brinner’s book indicates, that tension continues to work itself out (and into) cultural production in contemporary Israel. If “Middle Easternness” and bridges between west and east, he writes, are tropes that are traded “as commodities on the world music market,” Israeli musicians have “attempted to stake a claim by promoting their unique qualifications and position” (315). Playing Across a Divide finds a place in the “cultural turn” that has characterized the study of Zionism and Israel in recent years. Much of the recent scholarship associated with this trend has tended to prefer foci on aspects of Israeli history and society other than the Jewish-Arab encounter (although at times shedding important new light on that topic as well). Brinner’s book adds a dimension that is often neglected in the study of Zionist and Israeli culture, thus constituting a contribution to this new trend; yet he also takes on the problem of Arab-Jewish relations as a central theme, thus carving out a place for the new cultural focus even in what had been the purview of an earlier, more politically-minded, scholarly trend. In marked contrast with earlier studies on Arabs and Jews, Brinner examines their relations through the lens of music—collaborations between Jewish and Arab musicians, and their shared creation of both a new sound and musical scene. He thus fuses the older focus with more recent methodological interests, and in so doing, takes a notable step toward casting even this usually polarizing and contentious aspect of scholarship on Israel in an innovative light that is relatively free of the polemical vitriol that has often characterized the scholarly discourse. The music Brinner examines evolved in a historical context that oscillated wildly between a sense of dissension and despair in the late 1980s, through a period of near euphoric hope in the early 1990s, and on to the profound demoralization and bleak hopelessness that has characterized relations between Jews and Arabs in Israel and the Palestinian territories in the early twenty-first century. Brinner touches upon a number of provocative issues that are integral to this complex context, and which this reader often wishes he would have plumbed to greater depths. These include some of the defining tensions of these decades, such as imagery of east and west in Zionist and Israeli culture; the relationship between the individuals and ensembles that serve as Brinner’s subjects on the one hand, and the rise of popular musica mizrahit (“Oriental music”) in Israel during the same years on the other hand (something he does not examine, but which served as a central focus of the 2004 study by Edwin Seroussi and Motti Regev); the role played by references to nature, and to the desert in particular, in shaping the musical identities of these musicians and their relationships with Israeli and international audiences; and the conceptual stitching of ancient past and future-orientation in the imagery painted by many of these musicians. That being said, Playing Across a Divide is a pioneering study that points in these directions, and one can only hope scholars will take them up and continue to pursue them. 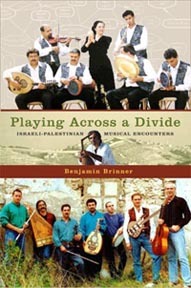 In its attempt to intertwine “the sociopolitical and [the] musical” (305), Brinner’s book marks an important shift in scholarship on Israel generally: perhaps its most important contribution, in fact, lies in furthering recognition of Israeli popular and ethnic music as a significant focus for research, and an important lens into key questions in the development of Israeli society, culture and politics. Edwin Seroussi and Motti Regev, Popular Music and National Culture in Israel (Berkeley, CA: University of California Press, 2004).